I'm behind with my crafting posts!!! I've been away from the blog for a while, but I am still still working hard! 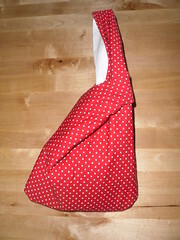 I have been making more bags. I have finally discovered Interfacing too. I wish I had known about it when I made that small black and white bag because it wouldn't be so floppy. I'll have to make another one some time soon. I found out because I treated myself to a pack of bag patterns, and it talked about interfacing so I ventured out to find out what it was, and buy some. I am completely sold on the stuff now and I think I'll be stocking up on different weights next time I'm in the craft shop. evening out. Not very practical for day to day use if like me you have two kiddies. Although it does fit into the change bag and keeps all my important things together! 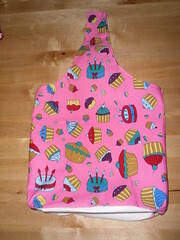 This is a slightly larger bag in this fun, if somewhat garish, bright pink cake fabric. I'm planning to make a few of these in different colours (I have the same fabric in blue) and make fun baking gift bags from them by filling them with things like cute baking cases, writing icing, cookie cutters etc. You get the idea! I'm not expecting the recipients to use the bags as handbags or anything though. They are just a bit of fun. 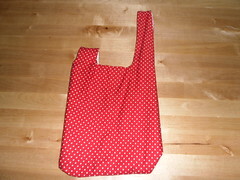 And - just for the fun of it - I have used up some of my fabric scraps to make myself a little something. 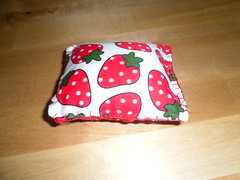 I have made myself a little pin cushion using some of the strawberry fabric I first started out with, and some of the dotty fabric I used on that first bag up there. 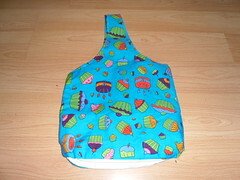 I used the sewing machine on it, but finished it off with some "shabby chic" style blanket stitching around the edges. I think it's so sweet that I have fallen totally in love with it! I made these years ago. But they are holding up so that's a good sign. Thinking about Christmas presents!!! 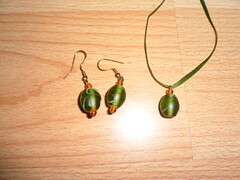 They were really simple to make, and not garish or too cheap looking (I think anyway). 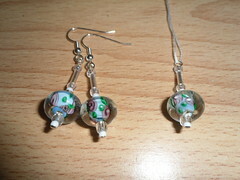 I've been ebay searching beads and I think I like the glass lampwork style the best. Now I know what I like I can start finding them in shops to get a good close look to find the ones I want to use. It's over a week since I made this now, but we had a weekend away, and the kids had colds, and routines have been out of wack so this is the first time I've had chance to snap some photos and get on here. Anyway, no need to witter on about this bag. It's just like the pink one, but blue! Sooooo...... 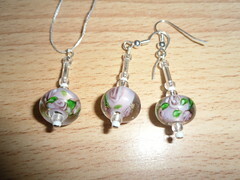 Here are my jewellery sets (so far). 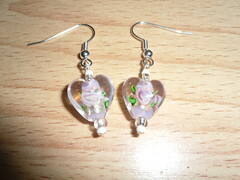 Pink Flowers, Blue Flowers, and Pink Hearts & Flowers. I think they're ok for early attempts! 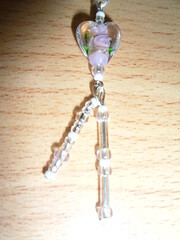 Even if my pendents are hanging on cross stitch thread for now!